Oh, wow, this book was so awesome! The synopsis really hooked me, and I just had to read it! The book within was so fantastic, and the pages just flew! There was so much action, but at the same time, great moments with the characters in this world that was just very well detailed! First off, I have to say, there were a number of Star Wars vibes. From an evil kingdom (which is similar to an empire) to the order that Cade joined when he was young that was a lot like the Jedi Order, yeah. That was so fantastic, Star Wars is just amazing! There were kinda 2 big weapons. The one that Cade had, that had a kind of sentience and was testing both Cade and Ga Halle, the leader of the evil kingdom. It also had this mythos of the Paragon, which Cade thinks it should've been his brother. But it can't be. Then there was the one that Praxis had, the War Hammer, which sucked the energy out of suns, which in turn killed the planets nearby. Yeah. Not cool! This whole book had a lot of intense action, but the ending really ramped it up! I just had to know what was going to happen next, because as Cade tells the Rai who trained him and who he had to rebel against, it was war. Yeah. Awesome ending! This book was so fantastic, and I can't wait to read more! Reason Why: Sounded really good, and it's a Prequel & Sequel Challenge 2018 Book! Michael Moreci is a bestselling author who’s the creator of numerous original comics series and has written and collaborated on multiple established properties. His sci-fi trilogy, Roche Limit (Image Comics),is currently in development for television with SyFy, and it was recognized by many publications as being among the best comics of 2015. It’s been called the “sci-fi comic you need to read” by Nerdist and io9, and Paste Magazine named it one of the “50 best sci-fi comics” of all time. Moreci has also written stories for iconic characters such as Superman, Wonder Woman, The Flash, and Conan the Barbarian. In 2018, Moreci's debut novel, Black Star Renegades, was released with St. Martin's Press. Drawing inspiration from the space operatics of Star Wars and the swagger of Guardians of the Galaxy, Black Star Renegades is a galaxy-hopping adventure that blasts its way from seedy spacer bars to sacred temples guarded by strange creatures--all with a cast of misfit characters charged with saving the world. His second novel, The Throwaway—an espionage thriller—is slated for release with Tor in June 2018. 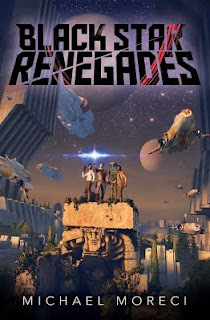 A sequel to Black Star Renegades will be released in 2019. He lives outside Chicago with his wife, two children, and his dog.